Eric Jeffrey Topol (born 1954) is an American cardiologist, geneticist, and digital medicine researcher. Before moving to Scripps in 2006, Topol served as chairman of cardiovascular medicine at Cleveland Clinic (1991-2005) and founded the Cleveland Clinic Lerner College of Medicine. Topol was one of the first researchers to question the cardiovascular safety of rofecoxib (Vioxx), culminating in the drug's ultimate withdrawal from the market. Topol's advocacy on the subject led to what the New York Times described as an "unusually public dispute" with the Cleveland Clinic's leadership over ties between the academic institution and the pharmaceutical industry, ultimately leading to Topol's departure from the Clinic after his administrative position as head of the Clinic's academic program was abolished. Mobile technology has transformed our lives, and personal genomics is revolutionizing biology. But despite the availability of technologies that can provide wireless, personalized health care at lower cost, the medical community has resisted change. 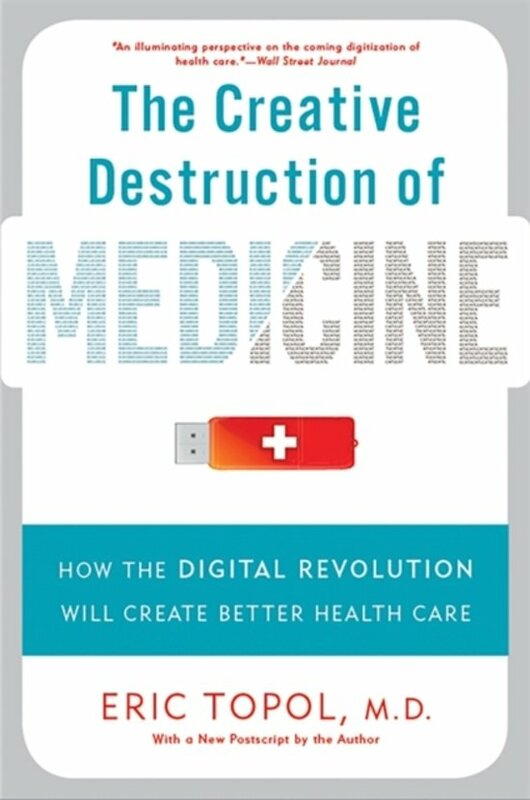 InThe Creative Destruction of Medicine, Eric Topolone of the nation’s top physicianscalls for consumer activism to demand innovation and the democratization of medical care.The Creative Destruction of Medicine is the definitive account of the coming disruption of medicine, written by the field’s leading voice. Siddhartha Mukherjee, author of The Emperor of All Maladies: A Biography of Cancer What happens when you combine cellular phone technology with the cellular aberrations in disease? Or create a bridge between the digital revolution with the medical revolution? How will minute biological sensors alter the way we treat lethal illnesses, such as heart attacks or cancer? This marvelous book by Eric Topol, a leading cardiologist, gene hunter and medical thinker, answers not just these questions, but many many more. Topol's analysis draws us to the very frontlines of medicine, and leaves us with a view of a landscape that is both foreign and daunting. He manages to recount this story in simple, lucid language--resulting in an enthralling and important book. Atul Gawande, M.D.,author of The Checklist Manifesto Dr. Eric Topol is an extraordinary doctor. He's started a leading medical school, identified the first genes to underlie development of heart disease, led major medical centers, and been a pioneer of wireless medicine. But he is also a remarkable communicator--one of the few top-flight scientists in medicine to be able to genuinely connect with the public. He was, for example, the first physician researcher to question the safety of Vioxx--and unlike most who raise safety questions, actually succeed in bringing the concerns to public attention. I have known and admired Dr. Topol for a long time. I recommend him highly. A. J. Jacobs, author of My Life as an Experiment and The Year of Living Biblically It may sound like hyperbole, but it's true: Medicine is undergoing its biggest revolution since the invention of the germ theory. As Eric Topol writes, thirty years ago, 'digital medicine' referred to rectal examinations. Dr. Topol is both a leader of and perfect guide to this brave new health world. His book should be prescribed for doctors and patients alike. Brook Byers, Partner, Kleiner Perkins Caufield & Byers This is the one book to read for a complete and clear view of our medical future, as enabled by the convergence of digital, mobile, genomic, and life science breakthroughs. Dr. Topol explains how iPhones, cloud computing, gene sequencing, wireless sensors, modernized clinical trials, internet connectivity, advanced diagnostics, targeted therapies and other science will enable the individualization of medicine--and force overdue radical change in how medicine is delivered, regulated, and reimbursed. This book should be read by patients, doctors, scientists, entrepreneurs, insurers, regulators, digital engineers--anyone who wants better health, lower costs, and participation in this revolution. Misha Angrist, Assistant Professor, Duke Institute for Genome Sciences & Policy, and author of Here is a Human Being Eric Topol is that rare physician willing to challenge the orthodoxies of his guild. He recognizes that in the U.S., health care business-as-usual is unsustainable. But he does not despair. He bears witness to the rise of Homo digitus and the promise it holds to upend the inefficiencies and dysfunction so entrenched in clinical medicine. The Creative Destruction of Medicine is a timely tour de force. It is a necessary heresy. Clayton M. Christensen, Robert and Jane Cizik Professor of Business Administration, Harvard Business School, and author of The Innovator's Dilemma Eric Topol gives us an eye-opening look at what's possible in healthcare if people can mobilize to charge the status quo. The Creative Destruction of Medicine is simply remarkable. Mehmet Oz, M.D., Professor and Vice-Chair of Surgery, NY Presbyterian/Columbia University Eric Topol outlines the creative destruction of medicine that must be led by informed consumers. Smart patients will push the many stakeholders in health to accelerate change as medicine adapts to a new world of information and technology. Jeffrey Immelt, Chairman and CEO of General Electric Eric Topol has been a longtime innovator in healthcare. In The Creative Destruction of Medicine, he citesthe big waves of innovation that will save healthcare for the future. Real healthcare reform has not yet begun, but it will. The Creative Destruction of Medicine lays out the path. George Church, Professor of Genetics, Harvard Medical School What happens when the super-convergence of smart phones further combines with million-fold lower-cost genomics and diverse wearable sensors? The riveting answer leads compellingly to a call to activism--not only for medical care providers, but all patients and everyone looking for the next 'disruptive' economic revolution. This future is closer than most of us would have imagined before seeing it laid out so clearly. A must-read. J. Craig Venter, Chairman and President, J. Craig Venter Institute Our sequencing of the human genome eleven years ago was the beginning of the individualized medicine revolution, a revolution that cannot happen without digitized personal phenotype information. Eric Topol provides a path forward using your digitized genome, remote sensing devices and social networking to place the educated at the center of medicine. Omar Ishrak, Chairman and CEO of Medtronic Eric Topol provides an excellent and pragmatic view of the U.S. healthcare system from a patient's perspective. He then offers, through numerous examples, an exciting vision for the future ... when technology can be used to dramatically improve the quality of care and reduce cost at the same time. The Creative Destruction of Medicine is a highly informative and enjoyable book, which truly triggers the reader's imagination as to what is possible Reed Tuckson, M.D., Executive Vice President and Chief of Medical Affairs, UnitedHealth Group Eric Topol has written an extraordinarily important book at just the right moment. Drawing upon a unique and impressive array of convergent expertise in medical research, clinical medicine, consumer and health technological advancements, and health policy, Dr. Topol opens the door for an essential discussion of old challenges viewed through an innovative lens. In the context of increasingly unaffordable health care costs, suboptimal quality of care delivery, a tsunami of preventable chronic illness, and new accountabilities for consumer's health choices and behaviors, this book helps all of us to think about solutions in new and exciting ways! Steve Case, co-founder, AOL, and founder of Revolution LLC Health care is poised to be revolutionized by two forces--technology and consumerism--and Dr. Eric Topol explains why. One-size-fits-all medicine will soon be overtaken by highly personalized, customized solutions that are enabled by breakthroughs in genomics and mobile devices and propelled by empowered consumers looking to live longer, healthier lives. Fasten your seat belts and get ready for the ride--and learn what steps you can take to begin to take control of your health. James Fowler, Professor of Medical Genetics and Political Science, UC San Diego, and author of Connected Eric Topol is uniquely positioned to write such a timely and important book. He leads two institutions--one in genomics and one in wireless health--that will each play a huge role in transforming medicine in the twenty-first century. From this vantage point, he can see unifying themes that will underlie the coming revolution in population and personal health, and he communicates his vision with vibrant energy. Everyone will want to read this book.